I am hungry but overwhelmed by the number of options and the large crowd. I am not sure what could be a fast but not terrible option. There are plenty of pubs, bars, and pizza serving window counters that face the street. The pizza windows alone probably provide a dozen options. Christ. I look to my left and see a taco stand. 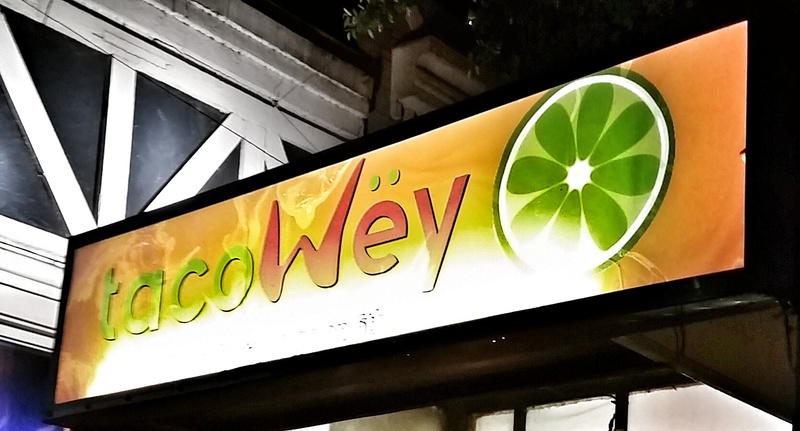 Taco Wëy. Sounds legit. I order some tacos, pastor and arrachera. Both were delicious (the arrachera was slightly more tasty) and the salsa was great. The tortilla not so impressive, but I figure this could be a Tex-Mex thing. The tortilla isn’t corn, but it’s a weird fluffy flour tortilla. Very strange. Some delicious Al Pastor - but note that fluffy tortilla! 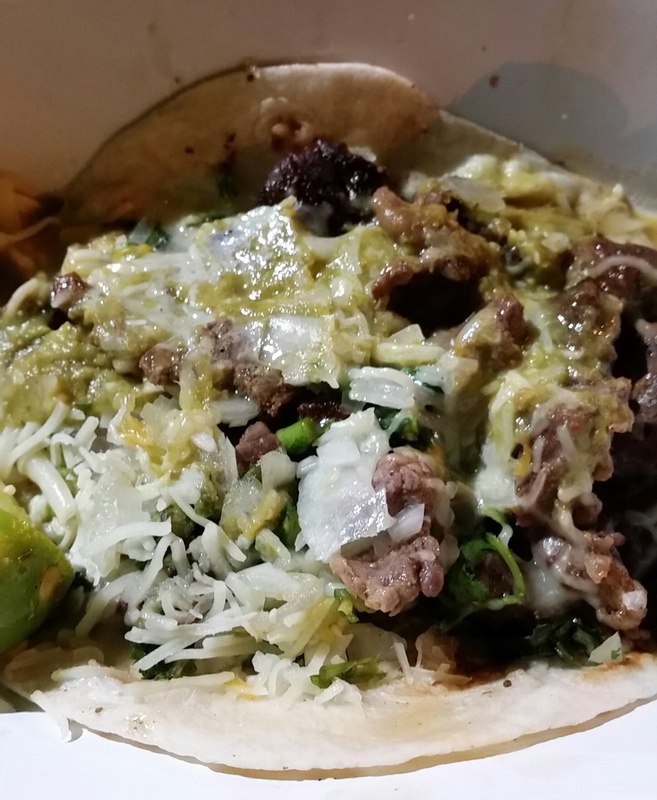 I eat my tacos alone on the sidewalk corner, watching the crowds. There is so much madness, I am not sure where to go. The whole spectacle is baffling. A few police officers stand near the barricades, monitoring. A few minutes later, there are police whistles, but they seem unmoved, a sign I take to mean this is all pretty normal. A cavalry of cops comes down the middle of the street. Six horse cops, blowing whistles for the crowd to part and let them through. There is no rush. It just is all part of this parading spectacle I am witnessing. Horsecops. Well, I guess that’s one way to know you’re in Texas. 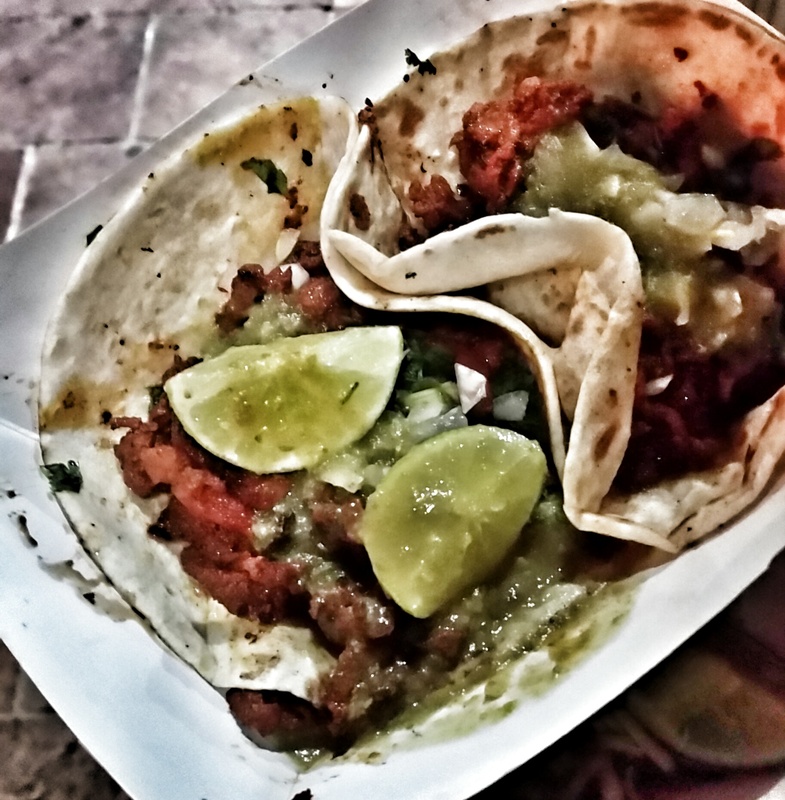 After I finish my tacos, I decide to just wander and walk to one end of the 6th St barricades and then loop around to go the other way to the other end. At some point I talk to one of the many pedicab guys waiting around to taxi people. He said that this, what I already think is crazy, is actually a slow night. I continue walking, trying to soak up my surroundings and this place. While I normally avoid crowds and find them draining, I am touched by the beauty of the architecture that surrounds me. I see all the history around me in these old bricks and stones, wood and metal, tile and adobe styled buildings. I wonder how many of these buildings were standing when this area was Mexico’s (you know, before we stole it so we can build that wall). I picture rancheros, old Mexican cowboys, roaming these streets on horseback: parched sand drenched in words like arroyo, compadre, and lluvia. It is strange to imagine these things while the buildings now stand dressed in strings of lights, windows aglow with neon colors, their signs of (probably) latex-based paint with incongruous names like Dirty Dog Bar, Shakespeare’s Ale-House and Voodoo Room–or mostly a large bat with glowing red eyes. Through one of those smokey windows, I imagine some young ranchero fell in love with some young woman on her way to the river–and how many moments like those must be drowned now in drunk college girls pole-dancing in barely any clothing at all, drowned in the douchey college guys screaming in their modern quién es más macho routine that they may not even be aware of (and likely aren’t), and drowned in the clash of guitars, drums, and middle-aged men singing in English. How times have changed. We live in a strange place. I tried to explain to a friend how isolating it is to be out in a crowd like this–the connections I feel don’t belong here. I see these old beautiful buildings dressed obscenely: I want to strip them down to just what they are and admire them. I want them to be naked! Empty and silent–no live music, no alcohol, no people. Only ghosts. I want to hear their stories–and I can’t. They are muffled and suppressed in the present, some sad attempt to acknowledge this greater history set in a small, easily overlooked bronze cast plaque. It makes me feel lonely. The crowd just magnifies the feeling.